I never saw Marlin Briscoe play college football, but as I came of age people who had see The Magician perform regaled me with stories of his improvisational playmaking skills on the gridiron, and so whenever I heard or read the name, I tried imagining what his elusive, dramatic, highlight reel runs or passes looked like. Mention Briscoe’s name to knowledgable sports fans and they immediately think of a couple things: that he was the first black starting quarterback in the National Football League; and that he won two Super Bowl rings as a wide receiver with the Miami Dolphins. But as obvious as it seems, I believe that both during his career and after most folks don’t appreciate (1) how historic the first accomplishment was and (2) don’t recognize how amazing it was for him to go from being a very good quarterback in the league, in the one year he was allowed to play the position, to being an All-Pro wideout for Buffalo. Miami thought enough of him to trade for him and thereby provide a complement to and take some heat off of legend Paul Warfield. The following story I did on Briscoe appeared not long after his autobiography came out. I made arrangements to inteview him in our shared hometown of Omaha, and he was every bit as honest in person as he was in the pages of his book, which chronicles his rise to stardom, the terrible fall he took, and coming back from oblivion to redeem himself. The story appeared in a series I did on Omaha’s Black Sports Legends, Out to Win: The Roots of Greatness, for The Reader (www.thereader.com) in 2004-2005. Since then, there’s been a campaign to have the NFL’s veterans committee vote Briscoe into the Hall of Fame and there are plans for a feature film telling his life story. Imagine this is your life: Your name is Marlin Briscoe. A stellar football-basketball player at Omaha South High School in the early 1960s, you are snubbed by the University of Nebraska but prove the Huskers wrong when you become a sensation as quarterback for then Omaha University, where from 1963 to 1967, you set more than 20 school records for single game, season and career offensive production. Because you are black the NFL does not deem you capable of playing quarterback and, instead, you’re a late round draft choice, of the old AFL, at defensive back. Injured to start your 1968 rookie season, the offense sputters until, out of desperation, the coach gives you a chance at quarterback. After sparking the offense as a reserve, you hold down the game’s glamour job the rest of the season, thus making history as the league’s first black starting quarterback. When racism prevents you from getting another shot as a signal caller, you’re traded and excel at wide receiver. After another trade, you reach the height of success as a member of a two-time Super Bowl-winning team. You earn the respect of teammates as a selfless clutch performer, players’ rights advocate and solid citizen. Then, after retiring from the game, you drift into a fast life fueled by drugs. In 12 years of oblivion you lose everything, even your Super Bowl rings. Just as all seems lost, you climb out of the abyss and resurrect your old self. As part of your recovery you write a brutally honest book about a life of achievement nearly undone by the addiction you finally beat. 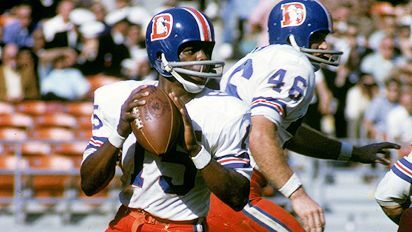 You are Marlin Oliver Briscoe, hometown Omaha hero, prodigal son and the man now widely recognized as the trailblazer who laid the path for the eventual black quarterback stampede in the NFL. Now, 14 years removed from hitting rock bottom, you return home to bask in the glow of family and friends who knew you as a fleet athlete on the south side and, later, as “Marlin the Magician” at UNO, where some of the records you set still stand. Now residing in the Belmont Heights section of Long Beach, Calif. with your partner, Karen, and working as an executive with the Roy W. Roberts Watts/Willowbrook Boys and Girls Club in Los Angeles, your Omaha visits these days for UNO alumni functions, state athletic events and book signings contrast sharply with the times you turned-up here a strung-out junkie. Today, you are once again the strong, smart, proud warrior of your youth. All my life I had been making adjustments and overcoming obstacles and drugs took away all my strength and resolve. When I think about it and all the time I lost with my family and friends, it’s a nightmare. I wake up in a cold sweat sometimes thinking about those dark years…not only what I put myself through but a lot of people who loved me. It’s horrifying. Or, like he was back in the day, when this straight arrow learned bedrock values from his single mother, Geneva Moore, a packing house laborer, and from his older cousin Bob Rose, a youth coach who schooled him and other future greats in the parks and playing fields of schools and recreation centers in north and south Omaha. For Briscoe, the pain of those years when, as he says, “I lost myself,” is magnified by how he feels he let down the rich, proud athletic legacy he is part of in Omaha. It is a special brotherhood. One in which he and his fellow members share not only the same hometown, but a common cultural heritage in their African–American roots, a comparable experience in facing racial inequality and a similar track record of achieving enduring athletic greatness. 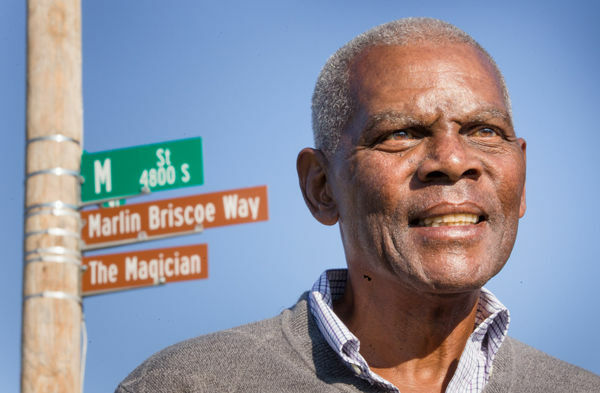 Marlin Briscoe, a South High alum, is honored with a street named in his honor on Oct. 22, 2014. Briscoe came up at a time when the local black community produced, in a golden 25-year period from roughly 1950 to 1975, an amazing gallery of athletes that distinguished themselves in a variety of sports. He idolized the legends that came before him like Bob Boozer, a rare member of both Olympic Gold Medal (at the 1960 Rome Games) and NBA championship (with the 1971 Milwaukee Bucks) teams, and MLB Hall of Famer and Cy Young Award winner Bob Gibson. He honed his skills alongside greats Roger Sayers, one of the world’s fastest humans in the early 1960s, NFL Hall of Famer Gale Sayers and pro basketball “Iron Man” Ron Boone. He inspired legends that came after him like Heisman Trophy winner Johnny Rodgers. Each legend’s individual story is compelling. There are the taciturn heroics and outspoken diatribes of Gibson. There are the knee injuries that denied Gale Sayers his full potential by cutting short his brilliant playing career and the movies that dramatically portrayed his bond with doomed roommate Brian Piccolo. There are the ups and downs of Rodgers’ checkered life and career. But Briscoe’s own personal odyssey may be the most dramatic of all. Born in Oakland, Calif. in 1945, Briscoe and his sister Beverly were raised by their mother after their parents split up. When he was 3, his mother moved the family to Omaha, where relatives worked in the packing houses that soon employed her as well. After a year living on the north side, the family moved to the south Omaha projects. Between Kountze Park in North O and the Woodson Center in South O, Briscoe came of age as a young man and athlete. In an era when options for blacks were few, young men like Briscoe knew that athletic prowess was both a proving ground and a way out of the ghetto, all the motivation he needed to work hard. Like many of his friends, Briscoe grew up without a father, which combined with his mother working full-time meant ample opportunity to find mischief. Except that in an era when a community really did raise a child, Briscoe fell under the stern but caring guidance of the men and women, including Alice Wilson and Bob Rose, that ran the rec centers and school programs catering to largely poor kids. By the time Briscoe entered South High, he was a promising football-basketball player. On the gridiron, he’d established himself as a quarterback in youth leagues, but once at South shared time at QB his first couple years and was switched to halfback as a senior, making all-city. More than just a jock, Briscoe was elected student council president. Scholarship offers were few in coming for the relatively small — 5’10, 170-pound — Briscoe upon graduating in 1962. The reality is that in the early ‘60s major colleges still used quotas in recruiting black student-athletes and Briscoe upset the balance when he had the temerity to want to play quarterback, a position that up until the 1980s was widely considered too advanced for blacks. But UNO Head Football Coach Al Caniglia, one of the winningest coaches in school history, had no reservations taking him as a QB. Seeing limited duty as a freshman backup to incumbent Carl Meyers, Briscoe improved his numbers each year as a starter. After a feeling-out process as a sophomore, when he went 73 of 143 for 939 yards in the air and rushed for another 370 yards on the ground, his junior year he completed 116 of 206 passes for 1,668 yards and ran 120 times for 513 yards to set a school total offense record of 2,181 yards in leading UNO to a 6-5 mark. What was to originally have been his senior year, 1966, got waylaid, as did nearly his entire future athletic career, when in an indoor summer pickup hoops game he got undercut and took a hard, headfirst spill to the floor. Numb for a few minutes, he regained feeling and was checked out at a local hospital, which gave him a clean bill of health. Even with a lingering stiff neck, he started the ‘66 season where he left off, posting a huge game in the opener, before feeling a pop in his throbbing neck that sent him “wobbling” to the sidelines. A post-game x-ray revealed a fractured vertebra, perhaps the result of his preseason injury, meaning he’d risked permanent paralysis with every hit he absorbed. Given no hope of playing again, he sat out the rest of the year and threw himself into academics and school politics. After receiving his military draft notice, he anxiously awaited word of a medical deferment, which he got. Without him at the helm, UNO crashed to a 1-9 mark. Then, a curious thing happened. On a follow-up medical visit, he was told his broken vertebra was recalcifying enough to allow him to play again. He resumed practicing in the spring of ‘67 and by that fall was playing without any ill effects. Indeed, he went on to have a spectacular final season, attracting national attention with his dominating play in a 7-3 campaign, compiling season marks with his 25 TD throws and 2,639 yards of total offense, including a dazzling 401-yard performance versus tough North Dakota State at Rosenblatt Stadium. Projected by pro scouts at cornerback, a position he played sparingly in college, Briscoe still wanted a go at QB, so, on the advice of Al Caniglia he negotiated with the Denver Broncos, who selected him in the 14th round, to give him a look there, knowing the club held a three-day trial open to the public and media. At the trial Briscoe turned heads with the strength and accuracy of his throws but once fall camp began found himself banished to the defensive backfield, his QB dreams seemingly dashed. He earned a starting cornerback spot but injured a hamstring before the ‘68 season opener. After an 0-2 start in which the Denver offense struggled mightily out of the gate, as one QB after another either got hurt or fell flat on his face, Head Coach Lou Saban finally called on Briscoe in the wake of fans and reporters lobbying for the summer trial standout to get a chance. Briscoe ran with the chance, too, despite the fact Saban, whose later actions confirmed he didn’t trust a black QB, only gave him a limited playbook to run. In 11 games, the last 7 as starter, Briscoe completed 93 of 224 passes for 1,589 yards with 14 TDs and 13 INTs and he ran 41 times for 308 yards and 3 TDs in helping Denver to a 5-6 record in his 11 appearances, 5-2 as a starter. Briscoe proved an effective improviser, using his athleticism to avoid the rush, buy time and either find the open receiver or move the chains via scrambling. “Sure, my percentage was low, because initially they didn’t give me many plays, and so I was out there played street ball…like I was down at Kountze Park again…until I learned the cerebral part of the game and then I was able to improve my so-called efficiency,” is how Briscoe describes his progression as an NFL signal caller. By being branded “a running” — read: undisciplined — quarterback in an era of strictly drop back pocket passers, with the exception of Fran Tarkenton, who was white, Briscoe said blacks aspiring to play the position faced “a stigma” it took decades to overcome. Despite his solid performance — he finished second in Rookie of the Year voting — he was not invited to QB meetings Saban held in Denver the next summer and was traded only weeks before the ‘69 regular season to the Buffalo Bills, who wanted him as a wide receiver. While Briscoe never lined up behind center again, soon after he left Denver other black QBs followed — Joe Gilliam, Vince Evans, Doug Williams and, as a teammate in Buffalo, James Harris, whom he tutored. All the new faces confronted the same pressures and frustrations Briscoe did earlier. It wasn’t until the late 1980s, when Williams won a Super Bowl with the Redskins and Warren Moon put up prolific numbers with the Houston Oilers, that the black QB stigma died. Briscoe was not entirely aware of the deep imprint he made until attending a 2001 ceremony in Nashville remembering the late Gilliam. “All the black quarterbacks, both past and present, were there,” said Briscoe, naming everyone from Aaron Brooks (New Orleans Saints) to Dante Culpepper (Minnesota Vikings) to Michael Vick (Atlanta Falcons). Making the Buffalo roster at a spot he’d never played before proved one of Briscoe’s greatest athletic challenges and accomplishments. He not only became a starter but soon mastered the new position, earning 1970 All-Pro honors in only his second year, catching 57 passes for 1,036 yards and 8 TDs. Then, in an example of bittersweet irony, Saban was named head coach of the moribund Bills in 1972 and promptly traded Briscoe to the powerful Miami Dolphins. The move, unpopular with Bills’ fans, once again allowed Briscoe to intersect with history as he became an integral member of the Dolphins’ perfect 17-0 1972 Super Bowl championship team and the 1973 team that repeated as champs. Following an injury-plagued ‘74 season, Briscoe became a vagabond — traded four times in the space of one year — something he attributes to his involvement in the 1971 lawsuit he and five other players filed against then-NFL commissioner Pete Rozelle, an autocrat protecting owners’ interests, in seeking the kind of free agency and fair market value that defines the game today. Briscoe and his co-complainants won the suit against the so-called Rozelle Rule but within a few years they were all out of the game, labeled troublemakers and malcontents. His post-football life began promisingly enough. A single broker, he lived the L.A. high life. 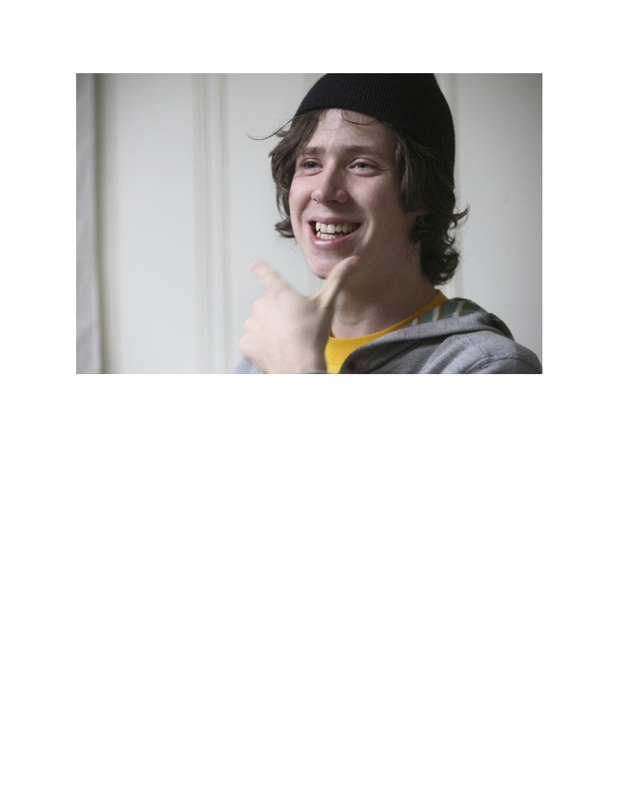 Slipping into a kind of malaise, he hung with “an unsavory crowd” — partying and doing drugs. His gradual descent into addiction made him a transient, frequenting crack houses in L.A.’s notorious Ho-Stroll district and holding down jobs only long enough to feed his habit. The once strapping man withered away to 135 pounds. His first marriage ended, leaving him estranged from his kids. Ex-teammates like James Harris and Paul Warfield, tried helping, but he was unreachable. Perhaps his lowest point came when a local bank foreclosed on his Super Bowl rings after he defaulted on a loan, leading the bank to sell them over e-bay. He’s been unable to recover them. He feels his supreme confidence bordering on arrogance contributed to his addiction. “I never thought drugs could get me,” he said. “I didn’t realize how diabolical and treacherous drug use is. In the end, I overcame it just like I overcame everything else. It took 12 years…but there’s some people that never do.” In the end, he said, he licked drugs after serving a jail term for illegal drug possession and drawing on that iron will of his to overcome and to start anew. He’s made amends with his ex-wife and with his now adult children. Clean and sober since 1991, Briscoe now shares his odyssey with others as both a cautionary and inspirational tale. Chronicling his story in his book, The First Black Quarterback, was “therapeutic.” An ESPN documentary retraced the dead end streets his addict’s existence led him to, ending with a blow-up of his fingers, bare any rings. Briscoe, who dislikes his life being characterized by an addiction he’s long put behind him, has, after years of trying, gotten clearance from the Dolphins to get duplicate Super Bowl rings made to replace the ones he squandered.